It is commonly asserted that scripture depicts an earth that is flat and motionless. While the number of references which suggest a flat earth are numerous and difficult to dispute, the number of passages which suggest a motionless earth are relatively few. A thorough assessment is provided. It is found that the motionless references are primarily sourced from round earth geocentrism, which creatively interprets select passages and ignores context to come up with a stationary and spherical earth. There are three main passages which geocentrists champion and interpret for the stationary nature of the earth. The term “will not be moved” in those passages is found to be in the context of “will not totter” rather than in the context of “stationary” or “motionless”. Flat Earth Geocentrists provide further pieces of evidence in the form of mentions of the foundations and pillars of the earth. It is found that when the foundation and pillars are cross-referenced with other passages and references on meaning, that they do not exist in the forms alleged. The context of the terms do allow motion. Indeed, there are several passages which suggest and indicate that the earth is in motion. Re: Does the Bible say that Earth is Stationary? "The New American Standard Bible is considered by some sources as the most literally translated of major 20th-century English Bible translations." Interestingly, despite the fame and the insistence, the words "motionless," "stationary," and "immovable," appear nowhere in the bible in regards to the earth. https://bible.knowing-jesus.com searches across over 30 different versions/translations of the bible. All four of these quotes seem to be saying the same thing about its establishment, the last one the most specific. Nor could any other related references be found for "not moved," "not moving," "still," "stationary," or "motionless." The ancients certainly knew the words for "motionless" and "immovable," as they use them in other areas of the bible, but it is not used for the earth. The earth being established so that it will not totter, does not equal motionless, stationary or immovable. Those were words attributed and popularized by a geocentrist somewhere. The earth being fixed in establishment so that it will not move from it (which seems to be clarified as totter) also does not directly equal 'is not moving' or 'can not move'. Especially when we look up what the foundation is. When assessing these passages one sees that it does not appear to literally say that at all. We also see that the ancients certainly could have specifically said motionless if they wanted to. There was language available to specifically declare the earth as motionless or still. Those words appear in other areas, of other things. In the case of "still," a great many times. They could have said it, but did not. There are four quotes like this. Three which said "will not be moved". One of them was more specific than the others, and which said that it was established so that it would not totter forever and ever. These are the key stationary and immovable passages championed by the geocentrists: "Will not be moved." "Will not be moved" appears to be clarified as "will not totter"
bring down (1), fall (1), falter (1), gives way (1), immovable* (1), moved (8 ), shake (1), shaken (11), shaken violently (1), slip (4), slipped (2), slips (1), staggering (1), totter (3), tottered (1), totters (1). A primitive root; to waver; by implication, to slip, shake, fall -- be carried, cast, be out of course, be fallen in decay, X exceedingly, fall(-ing down), be (re-)moved, be ready, shake, slide, slip. We find that “will not be moved” is clarified as “will not totter”. The purpose of Strong's Concordance is not to provide content or commentary about the Bible, but to provide an index to the Bible. This allows the reader to find words where they appear in the Bible. 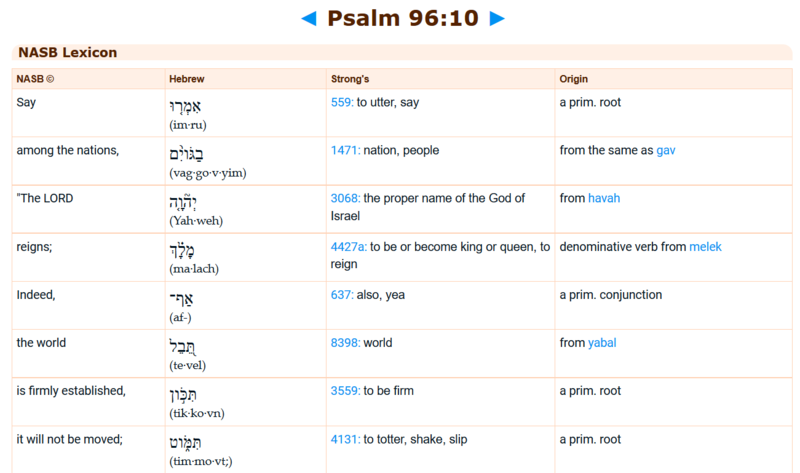 This index allows a student of the Bible to re-find a phrase or passage previously studied. 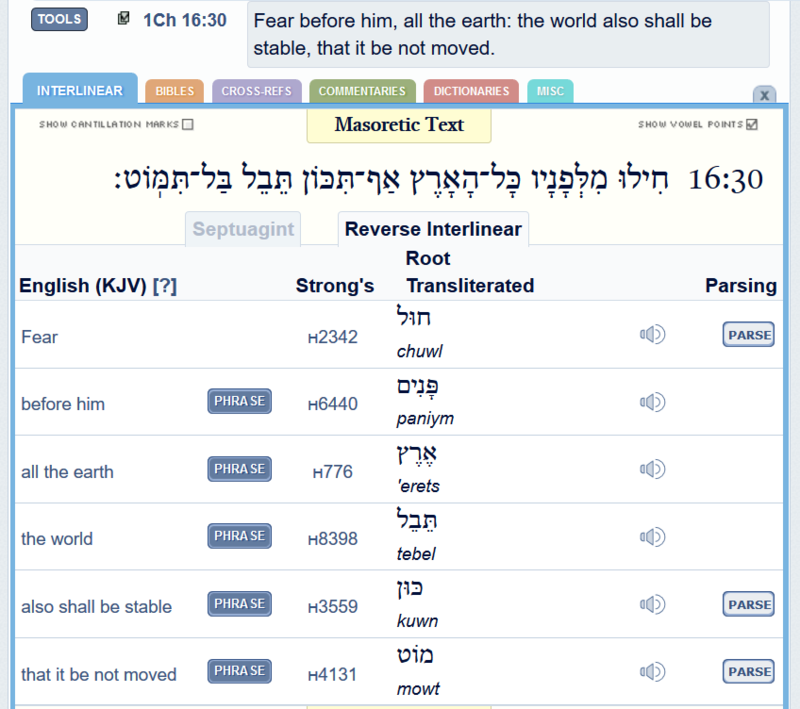 It also lets the reader directly compare how the same word may be used elsewhere in the Bible. In this way Strong provides an independent check against translations, and offers an opportunity for greater, and more technically accurate understanding of text. Essentially, Strong’s Concordance is a useful index which gives further clarification to the translations by giving context for how it is used elsewhere in the bible. Some passages in the bible make reference to a foundation of the earth, or the earth’s foundation. It has been asked and asserted that if the earth has a foundation then it surely must be immobile. Then the earth shook and quaked, The foundations of heaven were trembling And were shaken, because He was angry. Isaiah tells us that God founded the earth with His left hand, and the heavens are spread with His right hand, and that when He calls to them (presumably His hands), they stand together. This reads as verification of what the foundation is. The foundation is not any plane or object. The foundation is God, or the hand of God. The heavens are also on a foundation, which provides further clarification to its nature. Some passages also make reference to the “pillars” of the earth. It has been asked that, if the earth has pillars, how could the earth be in motion? 3. I also beheld the four winds, which bear up the earth, and the firmament of heaven. This concept of non-solid pillars is consistent with how pillars are portrayed throughout the bible. In the bible there are two types of pillars: Man’s pillars and God’s pillars. There is a difference. Man’s pillars are always made of solid substances such as stone, wood, or rock. God is above utilizing the materials of man for his pillars, however. God’s pillars are always made of cloud, fire, or nothing. God’s pillars are always in motion through space, move up and down, and have a purpose of moving or lifting. They are not static pillars like those of man. All the pillars around the court shall be furnished with silver bands with their hooks of silver and their sockets of bronze. It so happened when they were in high spirits, that they said, “Call for Samson, that he may amuse us.” So they called for Samson from the prison, and he entertained them. And they made him stand between the pillars. Man’s pillars are solid and static. Then the Lord came down in a pillar of cloud and stood at the doorway of the tent, and He called Aaron and Miriam. We can see the nature of God's pillars. For the pillars of the earth are the Lord’s, And He set the world on them. Now, would God be using man’s pillars for the above, or God’s pillars? Clearly, these type of pillars for the earth would have to be be God’s pillars. Not man’s pillars. God’s pillars are not solid, and move around through space for a purpose. The purpose of God’s pillars is not to be static like stone. God always purposes His pillars to move, lift, or to do something. In light of the above, man's pillars seem out of the question. The question should be what God's pillars are doing. Perhaps the most interesting part of the bible on this subject is how the earth's creation is portrayed. The following is the account of Genesis from the New American Standard Bible. Day 1: God creates the heavens and the earth. The earth is water and devoid of land. Day 2: God divides the waters vertically and creates the expanse. Day 3: God says "Let the waters below the heavens be gathered into one place, and let the dry land appear"
Reading this literally, from the most literal version of the bible, God creates something called the expanse below the earth that we are on, not above it. On the second day of creation God created the expanse below the earth that we are on. What is "the expanse"? Usually it has been interpreted, under the Round Earth mindset, to mean the firmament and the expanse of the heavens (as they believe in a large universe). But this does not make sense. On the first day of creation the heavens were already created. On day one of creation God created the heavens, and then on day two of creation God created the heavens again? Day Two of Creation depicts the Creator as dividing the primordial waters vertically to create the expanse, and that this expanse is apparently beneath the earth that we are on. Could the Universal Accelerator have been created on the Second Day? In Job we read the the earth is suspended over a void, rather than resting on anything in particular. The above appears to contradict the popular assertions that the earth is resting on any kind of foundational plane or on solid pillars. The bible contains several curious messages on how the earth stands. Surely My hand founded the earth, And My right hand spread out the heavens; When I call to them, they stand together. The opposite of stand appears to be fall. Colloquially, the opposite of fall is rise. Are the heavens and the earth rising? The foundations of the earth, which we had read were fixtures that keep the earth from tottering, or otherwise represent the hands of God, are shaken by God in His judgment of man's rebellion, completely destroying the earth. Earth's rebellion weighs it down. The earth will fall, never to rise again. Again? Again appears to say that the earth is normally rising, or at least that it has risen before. That sentence could have been written without the "again," but it was not. Falling, rising, both contradict the supposed rule for the immovability of the earth. All other versions of this passage, selectable through the top drop-down menu on that page, have the same "never to rise again" statement. The words around the "rising" phrase—of the earth shaking, tottering, splitting—are all direct and literal indications of the earth's motion; and so "fall" and "rise" must also be indications of motion. Now it came about after many days, when the Lord had given rest to Israel from all their enemies on every side, and Joshua was old, advanced in years, that Joshua called for all Israel, for their elders and their heads and their judges and their officers, and said to them, “I am old, advanced in years. And you have seen all that the Lord your God has done to all these nations because of you, for the Lord your God is He who has been fighting for you. See, I have apportioned to you these nations which remain as an inheritance for your tribes, with all the nations which I have cut off, from the Jordan even to the Great Sea toward the setting of the sun..."
"Now behold, today I am going the way of all the earth, and you know in all your hearts and in all your souls that not one word of all the good words which the Lord your God spoke concerning you has failed; all have been fulfilled for you, not one of them has failed." Joshua is a major figure in the book of Exodus, and an associate of Moses. Joshua was appointed by God to succeed Moses as leader of the Israelites, and has a book in scripture. The Book of Joshua is a book of the Bible. In this passage Joshua is very old and is giving his farewell address. Joshua tells us that today he will be going the way of all the earth. For Joshua, presumably that way is up, not down, and definitely not around the sun. A statement which, when taken literally, tells us that the earth is going the way of somewhere; that the earth is rising upwards. One may find it interesting that a group of people who believed that they were going to heaven when they died, and who wrote the bible through God, would say that they were "going the way of all of the earth" when they died. The bible says that language is a gift to man by God (Tower of Babel), which was a gift given to a period closer to Joshua than to today. If we examine the expression technique in verse, so we can see that the emphasis and meaning in the sentence overlap. The world's being firmly established and cannot be moved is an evidence of its judging the people with equity. Otherwise The rules will also vary in a non-fixed order. hence the meaning of the verse in terms of justice is reinforced by the fact that the earth's being stationary. to argue otherwise would be unfair to literary art in verse. I don't say it definitely has not the other meaning. There are some versions show it. If I deny it so it means I deny the bible if it has the other meaning. I agree it. But I just say, taking its meaning a stationary is stronger than taking its being stationary in the future. I do agree that it says and means "will not move," but in what context? Geocentrists proclaim that this means stationary, but we can see that this is not the case. Stationary is not stated, despite the language being available to describe something as stationary. "Shaking" and "tottering" is also a form of movement. A heavy and powerful train can be stabilized so it does not shake or totter from its tracks, limiting this form of movement. This was the outlier of the four. This verse says that the earth is established so that it "will not totter," correct? 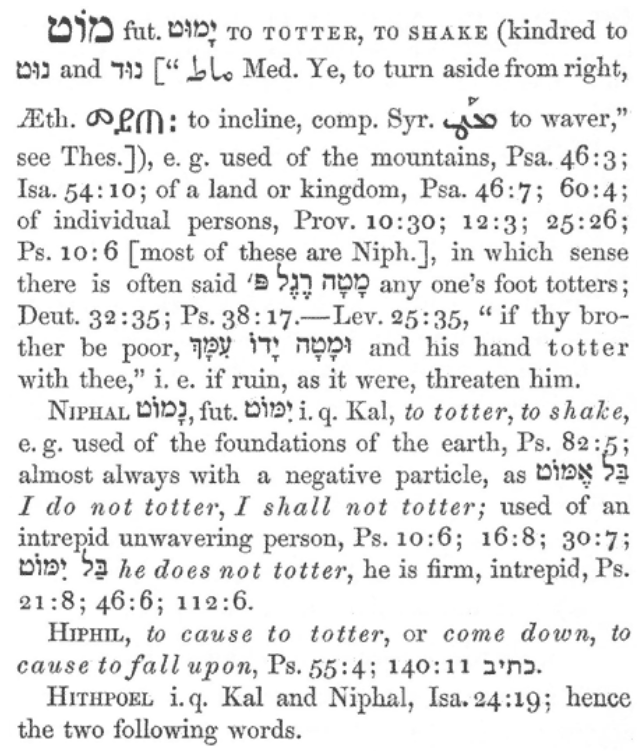 It just so happens that the same Hebrew word for totter in this verse is the same word for "moved" in the other three verses. We see Strong's #4131 again. The other two are Psalm 93:1, and 1 Chronicles 16:30, both of which use the same "totter" word for "moved". The same Hebrew "totter" word is used for these verses with whatever translation of the Bible we use. I have added a resource to the footnote of the OP: The scriptural basis for a geocentric cosmology. Despite being a hostile source, this page seems to have an organized collection of the biblical quotes that are given in support of a geocentric earth, which we have probably all seen before. It is seen that the concept of a stationary earth is mainly based on the interpretation of "will not be moved," which is Strong's H4131, and which we have seen is used elsewhere in the bible as "totter." We see that further support for the stationary earth is given by references to the foundations and pillars, which we went over above, and did not seem to exist as suggested. This lexicon was originally written by Heinrich Friedrich Wilhelm Gesenius (1786-1842) in the German language. Gesenius's influence as a master of Hebrew is widespread. The editors of the Brown-Driver-Briggs lexicon refer to him as the father of modern Hebrew Lexicography. Gesenius first published a work on Hebrew grammar in 1817 before turning his efforts on lexicography. A Hebrew and English Lexicon of the Old Testament, more commonly known as Brown–Driver–Briggs or BDB (from the name of its three authors) is a standard reference for Biblical Hebrew and Aramaic, first published in 1906. It is organized by (Hebrew) alphabetical order of three letter roots. It was based on the Hebrew-German lexicon of Wilhelm Gesenius, translated by Edward Robinson. The chief editor was Francis Brown, with the co-operation of Samuel Rolles Driver and Charles Augustus Briggs, hence the name Brown–Driver–Briggs. 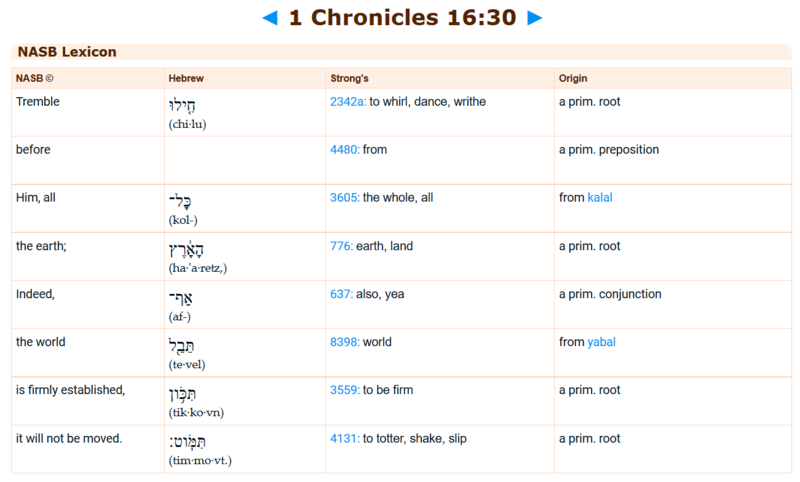 I notice that the Kings James Version of the 1 Chronicles 16:30, one of the verses in question, has the "firmly established" part translated as "shall be stable". A reference to stability ties in directly to the "totter" word. We see that this passage can be translated as "the world also shall be stable, that it be not tottered"
One might suppose that tottering would be a problem with a Flat Earth that is being pushed up by winds, and so this message that mechanisms were made against that to keep it stable should not be surprising to us. "Tremble before Him, all the earth; Indeed, the world is firmly established, it will not be moved." "Fear before him, all the earth: the world also shall be stable, that it be not moved." "tremble before Him, all the earth. The world is firmly established; it cannot be shaken." See the bolded. We find that the translations of the Bible are translating the phrase in different ways. The phrases appear to have been translated interchangeably and in accordance with the concordance definitions.